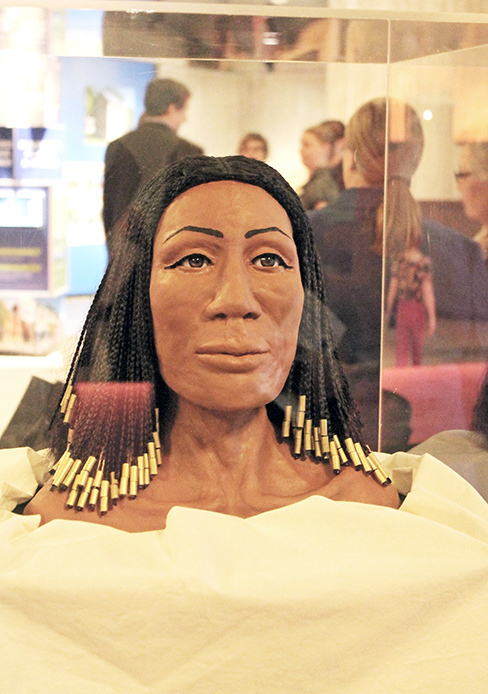 Alexandra Keenan-Krilevich’s final facial reconstruction of Amunet at the Ohio History Center. After thousands of years of concealment, one mummy is going from anonymity to Amunet, a woman with a name, a face and a past. Ohio State faculty and a student helped discover the history of Amunet, the almost 2,000-year-old mummy that will be on display at the Ohio History Center as part of its “Transformation” exhibit opening Wednesday. “The primary transformation we want to highlight is her transformation from an object to a person with her own identity,” Brad Lepper, curator of archeology for the Ohio Historical Society, said in an email. According to Lepper, the mummy and coffin have been with the Society since an American ambassador to Egypt, J. Morton Howell, donated it in 1925. The mummy was named Nesykhonsupashery according to the hieroglyphics on the coffin. But in August, a research team from the Society, with special help from an Egyptologist, learned the body inside did not match the coffin. They discovered when Howell acquired the coffin, it had been empty, so he arranged for another mummy to be placed inside and presented it as a set. It is unknown where the body of the real Nesykhonsupashery is today. OSU was already involved with the mummy when it was found that the coffin was not meant for Amunet. A team at the Wexner Medical Center had been taking CT-scans of the mummy after the Society reached out to them in June hoping to update its records and replace lost imagery from scans done in the 1980s. Dr. Joseph Yu, professor of radiology and orthopedic surgery, said he jumped at the opportunity. “(Mummies) give us the bridge in which we can study true humans in a time period no one can ever visit again,” he said. After the discovery that the mummy in the coffin was not Nesykhonsupashery, the mummy was renamed Amunet, meaning “the hidden one,” and the scans done by Yu and his team became more relevant in the search for clues to Amunet’s entirely unknown history. Yu said the scans showed her body was in good condition when she died, with little sign of injury or wear, and conclusions about her life can be drawn from this. “She was very well-preserved, so it allowed everyone to come to the conclusion that she was either well to do or in the clergy and definitely not involved in labor work,” he said. An analysis of her bones and remaining organs allowed the team to rule out many diseases as her cause of death, though the definitive cause remains a mystery. They also confirmed Amunet was about 40 years old. For more information, the OHS went to Kathryn Jakes, a professor in the College of Education and Human Ecology and expert in textile sciences. Jakes said textiles can be just as important as bones in determining the history of a mummy. Jakes studied the scans and the samples of the wrappings under a microscope to determine the type and estimate the era of the fabric. Radiocarbon dating, the determination of an archaeological specimen’s age by measuring its carbon 14 content, of Amunet’s wrappings put her life sometime around 800 B.C. Jakes also said the type and state of the fabric indicates the type of lifestyle Amunet had. All of this information gave her a story, and certified forensic facial reconstructionist Alexandra Keenan-Krilevich provided the last piece of her identity. “People forget that something like bones were once a person, were once alive and once did the same things that we do,” Keenan-Krilevich said. The 29-year-old was recommended to the OHS by her professor last spring, while she was working toward her undergraduate degree in anthropology at OSU. Keenan-Krilevich plans on finishing her degree Spring Semester 2014, though she is currently not enrolled in classes. In May she began the process of forensic facial reconstruction using a plastic replica of Amunet’s skull that was based on the CT-scans. This involves taking small, measured strips of clay and using calculations to place them strategically on the skull, though she said some features are also dependent on knowledge of anatomy, the time period and her own artistic skill. Keenan-Krilevich said she believes her study of science and anatomy, as well as her artistic background in modeling, photography and illustration, give her the necessary skills to reconstruct a face. “Even though it’s an artistic interpretation, it’s also a logical one,” she said. Lepper said in the email the work OSU did, both by telling Amunet’s story and “putting a human face on that story,” makes Amunet easier to relate to. When I was about ten years old(I am now 91)I used to spend many hours with the mummy. At that time we moved every 6 to 8 weeks. I was not allowed toys of any kind. We arrived in Columbus and as usual, I started to roam the area. I found your beautiful campus and everyone was very kind to me. No one told me to leave and I finally came upon my mummy. We were both lonely and I talked to it and tried to listen, too. I have never forgotten my time spent on your campus. I was so sorry to leave mummy dear. Now people always ask why I like Ohio State so much. Thank you. Thank you.